Imaginary Stories: Zarjaz #18 & Dogbreath #27 OUT NOW! Zarjaz #18 & Dogbreath #27 OUT NOW! 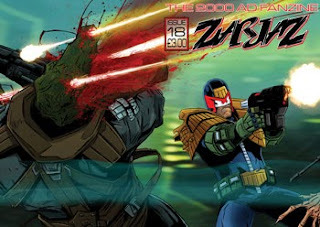 The latest issues of the 2000AD fanzines, Zarjaz and Dogbreath, are out now - and I've managed to blag my way into 'em both! I have to say, Jurassic Farce was an absolute blast to script. It's Judge Dredd versus a load of dinosaurs! What's not going to be fun about that? That said, the first page proved to be a complete dog to nail down; I knew how I wanted it to play out, but just getting those captions right so I could set the chaos loose in the rest of the script... But, still, this strip contains, possibly, my favourite scene I've ever written for Zarjaz, maybe even one of my favourite things I've ever written at all. This is my first time working with Stewart and - at the risk of sounding overly hyperbolic - his work on this just blew me away. He brings a sense of dynamism and intensity to each page that just grabs you and doesn't let you go until the final panel. 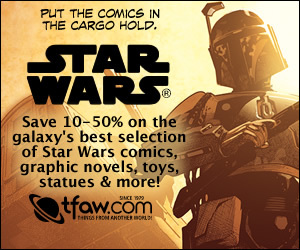 I'll admit, there were a few things in the script that I was never sure would work well on the finished page, but Stewart took them on and just made the whole story unfold beautifully, injecting it with a real sense of chaos and danger. He is most definitely an artist that is "Prog ready", and I wouldn't be surprised if his name pops in 2000AD in the near future. It was an absolute pleasure doing this with him, and I really hope this is the first of many collaborations. 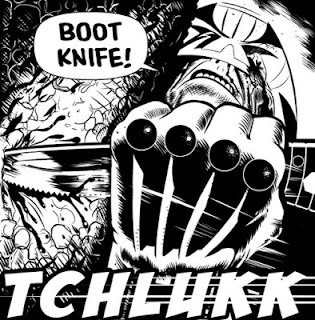 However, Stewart will be returning to the mean streets of The Big Meg as the illustrator for Tin Man's second Dredd gamebook, Judge Dredd: The Dark! 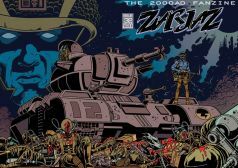 The complete running order for this Dredd-centric issue is available over at The Quaequam Blog. This is my first time working with Bolt-01 as an artist (all our previous collaborations have been with him as the letterer and/or editor) and, I have to say, I was wowed with what he produced. I'd seen some of his sketches on his blog (and have an original sketch of The Mighty Tharg by him on my first ever acceptance note from Zarjaz), so I had an idea of what his style looked like, but he really impressed me with his storytelling clarity and page composition. I think Bolt-01 may well be one of the best hidden secrets in the UK small press right now... And it gives me great pleasure to say we've got something else cooking at the minute. More when I can say. The complete running order for this issue is available over at The Quaequam Blog. 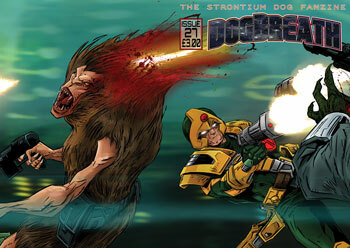 Zarjaz #18 and Dogbreath #27 are both available now, priced £3.00 (+ P&P) each. You can get them both - and a whole lotta back issues - from the FutureQuake Shop, and they're also both available from the FQ Comicsy Shop!